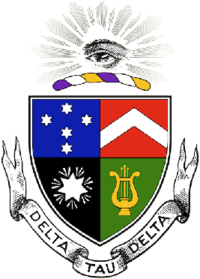 DELTA Tau DELTA was founded at bETHANY COLLEGE IN BETHANY, VIRGINIA IN 1858. The DELTA PSI chapter of DELTA Tau DELTA was originally founded at UCSB in 1949. Delt here at Delta Psi incorporates the foundations of the National Fraternity, being Truth, Courage, Faith and Power, and allows the values to commingle with the west coast fraternal vibe. Santa Barbara allows Delts to be true to themselves; we embrace the easy going way of life that the “best coast” provides us. Courage comes in the form of taking the step into the unknown in even joining a Greek organization, but also being courageous in everyday life. For example, having the courage to take on 21 units and crush it, or ride out a gnarly wave at Campus Point. The opportunities for Courage to be displayed here are endless. Our Faith lies within. We at Delt believe in our own abilities, the abilities of our brothers, and we have faith that with the values and mindset we’ve undertaken, nearly nothing can stop us from achieving the goals we set out for ourselves. Finally, we see Power as a trait, not denoting a hierarchical structure. Delt provides the tools for each individual to find within themselves their own power. The power of a sound mind, a sound heart, a strong body, and a strong will are all instruments that contribute to a Delt’s ideal form of Power. I personally have Delt to thank for my maturation process. Without coming in as a new member 2 years ago, and learning the values that this fraternity taught me, I would not be the independent individual I am today. Because of my individual investment in the fraternity being so strong and so quick, I was able to do much for myself that I truly believe would have never occurred otherwise. When in need of a job, a brother referred me to work for an employer, and I was hired within a week. When I was struggling to make ends meet, I had a brother take me on the largest grocery shopping spree I had ever been on. He expected nothing in return. My time at Delt has been marked with constant brotherhood, through the good and the bad. Regardless of any obstacles that have come our way, we have made it out the other side, and we have done so together. They say nothing in life is certain, but I certainly love my fellow brothers, and I am certainly proud to be the president of Delta Psi’s chapter of Delta Tau Delta. Frat Doggo Spotlight: The honor goes to non other than @lilfloofermaya this weekend 🎉 Maya loves yogurt, Costco rotisserie chicken, & the boys 🤙🏼 Happy Saturday! #1 in kickball, and #1 in philanthropy 🥇 thank you @ucsbtheta for hosting an fun philanthropy for CASA!